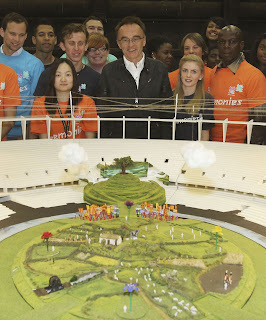 With 45 days to go to the Opening Ceremony of the London 2012 Olympic Games preparations have picked up a pace, and today artistic director Danny Boyle has paid tribute to the 10,000 volunteers, cast and crew rehearsing night and day to make the Opening Ceremony a success. There have already been 157 cast rehearsals for the Olympic Games Opening Ceremony, with volunteer performers giving up their evenings and weekends to take part in 37 rehearsals at the new site in Barking & Dagenham where detailed preparations for both the Olympic Opening and Closing ceremonies are taking place. 3 Mills Studios remains the production base for the London 2012 Ceremonies Team where the prop store is currently looking to complete the production of 12,956 props and staff in the costume department are working hard to produce 23,000 costumes for all four ceremonies, including sewing 24,570 buttons onto the costumes for one of the opening sequences of the Olympic Games Opening Ceremony. In the Olympic Stadium the installation will begin shortly for ceremonies lighting which includes 1,100 automated lamps, 1,000 conventional lamps, 500 LED fixtures, and 32 follow spots. This will be accompanied by a million watt sounds system using more than 500 speakers and 50 tonnes of associated sound gear. Work has now started to install the set for the opening scene of the Ceremony, which is called ‘Green and Pleasant’. On entry to the Olympic Stadium in East London the audience will see a scene that represents a traditional and idyllic view of the British countryside. 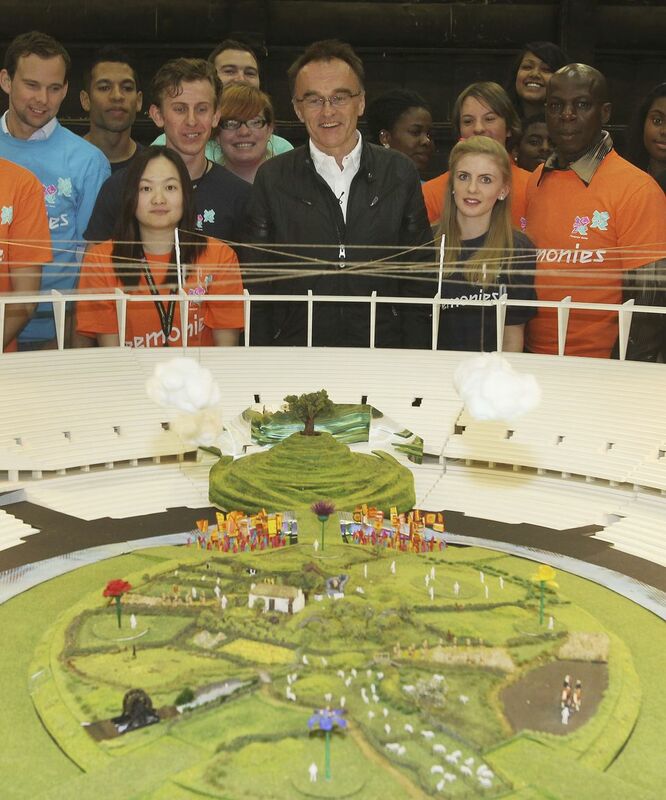 The whole of the field of play in the Stadium will be transformed into the rolling British countryside as the London 2012 Ceremonies Team creates one of the largest sets ever built. The set will be complete with meadows, fields and rivers, and featuring families taking picnics, sport being played on the village green and farmers tilling the soil whilst real farmyard animals graze – including 12 horses, 3 cows, 2 goats, 10 chickens, 10 ducks, 9 geese, 70 sheep, and 3 sheep dogs. Each of the four nations will be represented by their national flower– the rose of England, the thistle of Scotland, the daffodil of Wales and flax from Northern Ireland. The BBC was today officially announced as the ‘London 2012 Olympic Ceremonies Featured Film Producer’, with the news that it will make two short films for the Olympic Opening Ceremony. With the title ‘Isles of Wonder’, the first film will be at the very opening of the show. The other will appear later. Other than the films, working in partnership with LOCOG, the BBC will also be offering live camera feeds into the ceremony on the night. The worldwide broadcast of the Ceremony will commence at 21:00 on 27 July 2012, with the pre-show starting at 20:12. The Ceremony is predicted to be viewed live by a worldwide TV audience of over a billion people. The Ceremony will open with the ringing of the largest harmonically-tuned bell in the world, produced by the Whitechapel Bell Foundry, measuring two metres tall by three metres wide and weighing 23 tonnes. The Olympic Broadcast Service (OBS) produces the live global feed of TV coverage of all the Olympic Sport and Ceremonies at London 2012 whilst the BBC is the UK’s domestic rights holding broadcaster. Find out the latest from London 2012 HQ on our blog http://www.london2012.com/blog, follow us on Twitterhttp://www.twitter.com/london2012 or download the Official London 2012 Join In app.